A snow-covered football pitch at Tilekiln in St Leonards last Friday afternoon. For the first time this season, the entire Macron East Sussex Football League schedule was wiped out by the weather last weekend. All 27 of the scheduled league and cup matches were postponed due to the wintry weather which battered the country last week. The snowy scene at The Salts, home of Rye Town Football Club, on Saturday morning. Although a few teams only have two league matches remaining, there are some sides who are only halfway or less than halfway through their league programme. 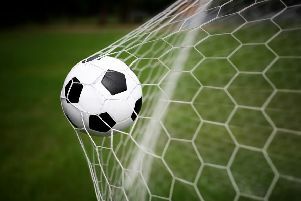 Crowhurst have 11 Premier Division games to go, plus at least one cup match, while title hopefuls Hollington United have nine league fixtures remaining and are through to the semi-finals of two cups. Division One high-flyers Bexhill AAC have nine league encounters left and are still involved in three cups, and the same applies to Division Two outfit Sovereign Saints. There are only eight Saturdays remaining between now and the end of April, so a hectic end to the season lies in store for all of these sides and several others. Battle Recreation Ground, home venue for Battle Baptist Football Club, was again looking decidedly wintry on Saturday morning. A full programme of league fixtures, plus a handful of cup ties, are scheduled for tomorrow (Saturday) and all concerned will be eager to get back playing again. Tomorrow’s games include a quarter-final and semi-final in the Premier Travel Challenge Cup and Wisdens Sports Challenge Cup, plus a Coopers Construction Challenge Cup semi-final.